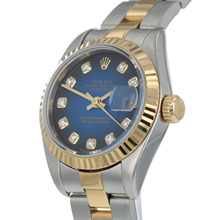 The Rolex Datejust is the modern archetype of the classic watch, thanks to aesthetics and functions that transcend changes in fashion. Aesthetically, the Datejust has spanned eras, while retaining the enduring codes that make it, notably in its traditional versions, one of the most recognised and recognisable of watches. 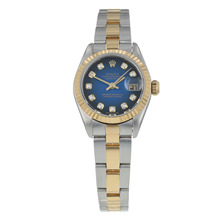 This Pre-Owned Rolex Datejust Ladies Watch 79173 comes equipped with a 26mm stainless steel & yellow gold case, which houses the blue dial and hand-made automatic movement that provides the power. 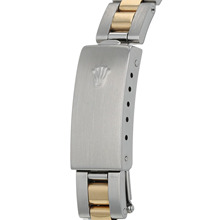 Attached to the case is a stainless steel & yellow gold bracelet, fitted with a folding clasp for increased comfort on the wrist. 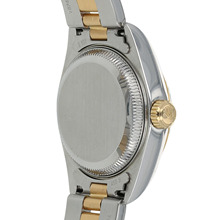 The timepiece is water resistant up to 100 metres. Packaging - Box and Paperwork Included. Rolex service history included. Bracelet Length (Including Case) - Approximately 18.5cm.